‘Just for the Holidays’ originated from a story told to me over a meal. My friend’s holiday with her sister had gone from bad to worse as the sister dropped bombshell after bombshell on her. I asked if I could use the idea, suitably modified, explored it a bit more, decided what would suit me and what would need to be changed, and in which sort of direction I’d take things. My characters come to me early in the process. I begin with hero and heroine. My subconscious plays with them, too, and I find myself making decisions that I’m not completely aware of making. For ‘Just for the Holidays’ I decided that Leah is, like me, a bit of a petrolhead. This is going to allow me to have some fun with the research, as she does track days and goes to motor sport events so, naturally, so will I have to! One big element to her character was established by the initial idea: Leah has chosen not to get married or have children. She’s a free spirit and likes her life exactly as it is. I wanted her to have a cool job and found a suitable one, one most people wouldn’t count as a job. Importantly, Leah has an older sister, Michele, who’s quite different: a teacher, married with children. Between the different lifestyles of the two sisters lies a lot of emotion and conflict. Ronan is a grounded helicopter pilot. I’ve tried to make him something else because I’ve written about helicopters once before but he came to me as a grounded helicopter pilot and my subconscious has turned obstinate about it. Again, research is a pleasure. And if anyone would like to take me up in a helicopter, please get in touch. Now comes the part where I take these few facts and develop something bigger. I create secondary characters to impact on the hero, the heroine and the plot. 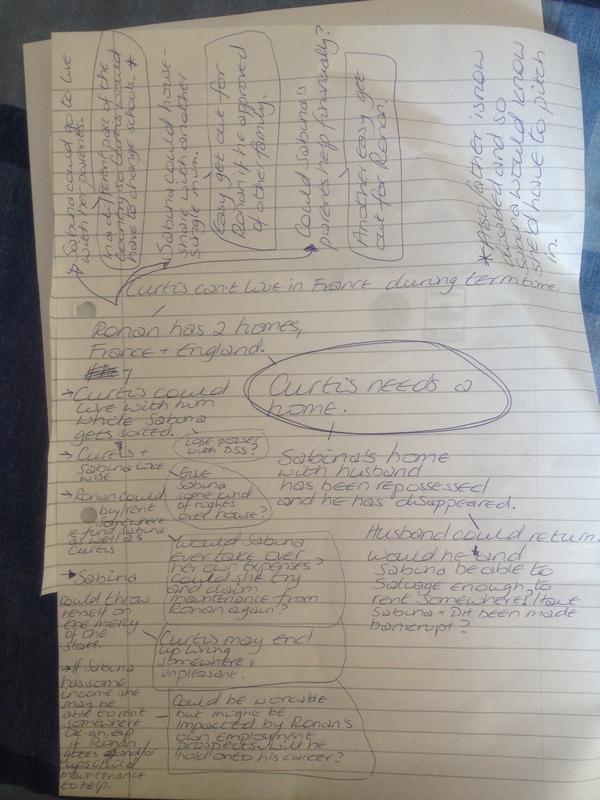 I give Ronan and Leah conflicts, I explore their lives, their histories, their goals. I mull over what’s drawing them together and what will keep them apart. I look at them from the points of view of other characters – what does her sister think of Leah? What does Ronan think of her? What does her employer think of her? What does Leah think of him? What does his son think of him? etc etc. I feel this technique gives me properly rounded characters. For some reason, I almost always plan on paper, with a pen. Maybe I think better with a pen in my hand. It’s certainly not because I like handwriting, or that my handwriting is attractive. I’m now fortunate enough to have a second desk for when I’m writing by hand. 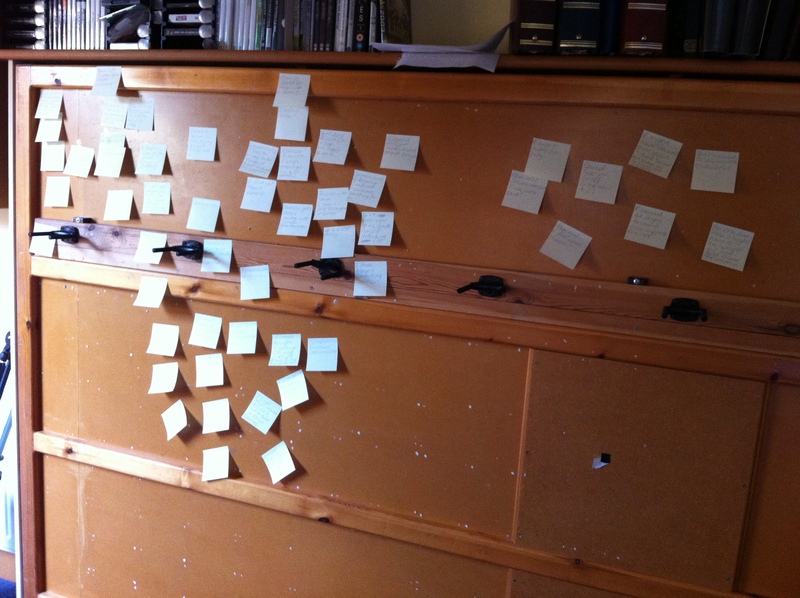 On the opposite wall is an area I can use to cover with sticky notes, if that’s what seems a good idea at the time. Here’s a plan when things became a lot less straightforward. It began well. But I introduced a second issue that would impact on the first and found it wasn’t working with the same logic and ease. 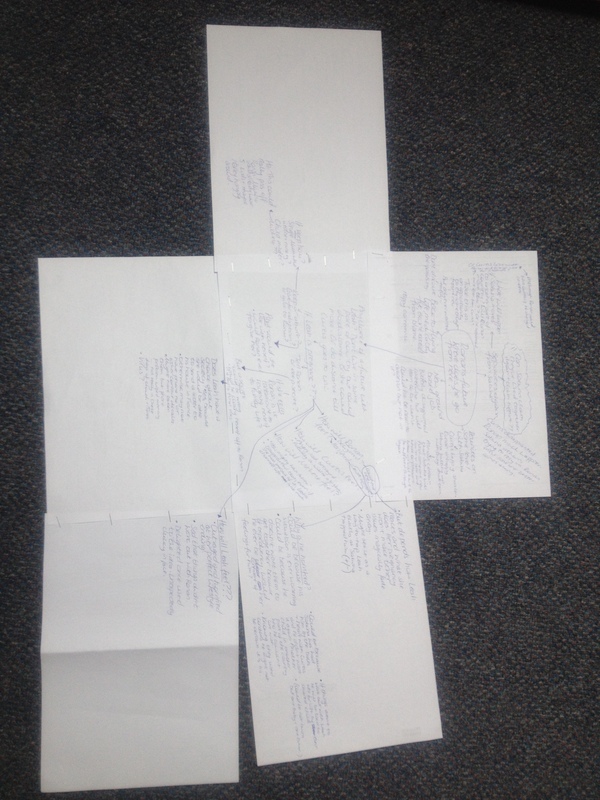 Everything I thought of seemed to give rise to more and more to think of – hence the additional bits of paper stapled together as my exploration got too big for the page. Stuck, I paused for thought. Should I buy a new stationery tidy, now I have this second desk? Ooh, look, I didn’t realise that my long-arm stapler could extend its reach just by moving something along a bit … I clicked my pen and stared at the plan. By the end of the day all I had decided was that the second issue wasn’t working. During the evening, my subconscious kept drawing my attention away from the TV, my dinner, and the book I was reading, worrying at the second issue. Just as I was going to bed – bingo! I realised what was wrong with my issue (too close to something I’d used in another book) and what I could do to change it. The important thing, to me, is that the plan did its job. Knowing when something isn’t working is as important as knowing when it is. So, back to my second desk, this afternoon, to work on secondary character bios, drawing all the many pieces of my jigsaw together. It will probably be a couple of weeks before I feel ready to type ‘Chapter 1’ into a new Word document on my Mac. Me and my subconscious have a lot to do before that. Always interesting to see how other people work. I’m tussling at the moment with my second edit of my follow-up novel and somehow need to inject more conflict but not sure how to do this without altering the essential timeline, essential because there’s a baby involved! Brilliant post Sue, thanks for sharing. Like you, I have to do a lot of thinking about characters and plot before I actually start writing that first scene. Good luck with Just for the Holidays. Maybe people who don’t do that kind of planning have a better memory or bigger brain than I do, or their characters just arrived fully formed. This is a very interesting post. You’re right, knowing that something isn’t working is very helpful. I think that gut feeling of something not being right comes from clues that your subconscious has picked up, but decided not to tell your conscious mind. I plan on paper too. I do too, but I wouldn’t be able to reach the top bits.